Though I’ve never been particularly afraid of needles, I wouldn’t say I necessarily enjoy them either. I tend to look away from (and brace for) the puncture during routine doctor’s appointments, and the few times I’ve given blood haven’t exactly been a physically enjoyable experience for me. That said, when I caught wind of the IV drip therapy trend, I was willing to make the sacrifice. Before jumping into it, though, I did my due diligence. In this case, that entailed ample research and several honest conversations with medical professionals about the potential benefits and drawbacks of IV drip. Here’s what I learned along the way. 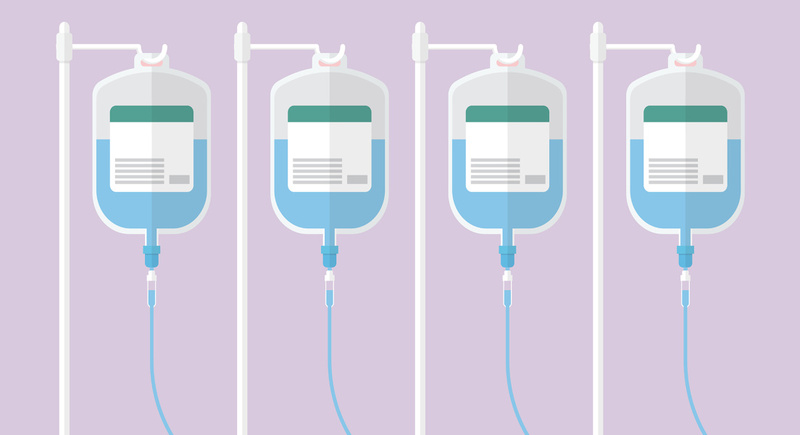 IV drip therapy — sometimes referred to as “hydration therapy” or “vitamin drip” — is an in-office procedure where vitamin-packed fluids are administered directly into your bloodstream intravenously (IV). A medical professional will find a healthy vein in your arm, clean the injection site, and then insert a needle directly into the vein. A saline bag filled with a bevy of vitamins is then hooked up to the IV (more on these vitamins later! ), allowing the contents to slowly enter your bloodstream. “When you take your vitamins orally, they have to be processed through the stomach, and they lose a lot of their nutrients in that way,” explains Karla Ippolito, the certified physician’s assistant at Scottsdale’s MD Skin Lounge who personally administered my IV drip. Because the treatment may have a multitude of health benefits, it’s been introduced to med spas far and wide. Ippolito notes that at MD Skin Lounge, IV drip is often performed in conjunction with other treatments, as a sort of “add on” during your appointment. You can also find clinics and spas that specialize specifically in drip, such as NYC’s The I.V. Doc or Los Angeles’ The Drip Doctors. Before my appointment formally began, Ippolito asked me about my medical history. Wherever you go, this should be the first question you’re asked. “A lot of the things that are in this bag [may] help boost your immune system,” explains Ippolito. “However, if you have too much of certain vitamins, minerals, or amino acids, it can be harmful to you. Also, if you’re taking certain medications, it can actually exacerbate [make worse] some of the side effects of those medications,” she warns. Once you’ve painted a clear picture of your medical background, you’ll either move forward with the treatment or your physician will suggest an alternative. If you do get the IV drip, the primary risk to be aware of is potential infection. Anytime a puncture is involved — and this includes blood draws — there’s a risk of infection. Going to a reputable location where they’re working in a sterile environment and following medical protocol will dramatically reduce your risk for infection. After getting the all-clear, I shared what my specific goals were for the appointment. Outside of sheer curiosity, I wanted to see if it would have any benefits for my skin, alertness, and energy (I’ve been hitting the gym hard these days). My specific bag, which is reflective of what you’ll find at other clinics, contained Methionine Inositol Choline (MIC) with a vitamin B complex, vitamin C, zinc, and glutathione. The zinc helps rev up your immune system and can even assist with healing, and glutathione is an antioxidant that can help repair and prevent damaged cells. Hooking up the IV was actually pretty painless. It took probably five minutes to find a “good vein,” and then once the IV drip began, it was a waiting game. They handed me the remote (I watched almost a full episode of “Orange Is the New Black”) and I didn’t feel pain or discomfort at any time outside of the small pinch from the initial injection. Now that you know why someone would get IV drip and what an appointment is like, I’m sure you’re wondering if it’s all worth it. While I cannot speak for everyone, my experience was very positive. I didn’t have an immediate boost like the one you’d get from downing a cold brew, but I did feel noticeably better. That evening, during an intense circuit boxing workout, I felt invincible. I don’t know how much of it was mental and how much was just a genuine physical boost from my vitamins, but I was really hitting my goals. This notable energy boost and mental clarity lasted throughout the week as well, and began to taper off about eight to 10 days in. Regarding aesthetics, I couldn’t tell a huge difference in my skin quality, but I’m hyper-religious about slathering on creams and oils every night. I will say that I was more hydrated over the next 24 to 48 hours, which is credited to all that saline. (As an aside, I peed more frequently in that timeframe and it had an unmistakable vitamin-y odor). For my post-procedural care, I was instructed not to take any vitamins for the next week (just to be on the safe side and avoid ingesting too many), which equates to wasted time/money if you’re going more frequently than you need to. If you’re maintaining a solid regimen and living a healthy lifestyle, IV drip could serve as an additional boost to that. In that sense, it should be considered a supplement — not a replacement — to any skin or heath routine you’ve got going on. Also, as is the case with any medical procedure, Dr. Katz stressed the importance of speaking to your doctor beforehand about what’s best for you, and to only have IV Drip treatment under strict medical supervision.